If you are taking online paid surveys, you have probably tried to be rejected for surveys. Sometimes it can maybe even feel like you are disqualified for most surveys and you are getting frustrated about this. Let me just start by saying that it is perfectly normal not to qualify for all surveys – there are reasons that you do not always qualify. 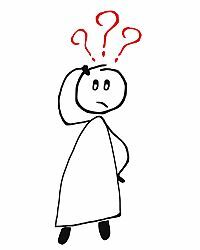 I do however know from personal experience how frustrating it can be and below I will, therefore, explain what these reasons are, and how to qualify for more surveys. Am I not qualifying because survey sites are scams? If you often do not qualify for surveys, you might think that maybe survey sites are just scams, and it is not really possible to make money on them. I know how frustrating it can be to continuously not qualify, and often I do also not qualify myself, so I completely understand the thought and I regularly hear it from visitors here on PaidFromSurveys.com. But I also know by now that sometimes it happens (and sometimes a lot). Sometimes you will not qualify for a survey – this does not mean survey sites are scams. I do however also know that it is possible to make nice extra money on surveys, and I have figured out how to navigate the best way, so I do not have to become frustrated about not qualifying. Not qualifying for surveys at a certain site does not mean that it is necessarily a scam site. You cannot use this as an indicator alone to see if a site is a scam or not. Nobody qualifies for all surveys, and everybody that takes surveys, have tried or will try not to qualify for several surveys. There are a number of factors that decide how often you will qualify, and if you have an idea about this, it will make it easier to understand why you do not qualify and what to do to qualify as often as possible. As mentioned already, there can be several reasons you do not qualify for a survey. The list below will explain the main reasons you will not qualify, so you can get a better understanding of why it happens before we then go into what you can then do to qualify more often. At the beginning of most surveys, there will be a few screening questions. This is to make sure you fit into the target group of the survey. That can be questions about age, habits, gender, where you live, education, etc. If you think about it, it makes sense that surveys have these screenings. For example, if you do not drink alcohol, it does not make sense that you participate in a survey where a vodka company wants feedback on their new product. Very often, that you do not fit into the target group, is the reason you do not qualify. But do not let this stop you. There will be surveys for you as well – it is just a matter of finding the right ones for you, which we will get into later. The country you live in will mean a lot when it comes to the surveys you will qualify for. Some survey sites offer surveys all over the world, but others just allow you to sign up no matter where you live without actually having surveys for you. An example of this is Vivatic, where everybody can sign up, but if you do not read the conditions, you will not know that they actually only offer surveys to people living in the UK or the US. Some sites only give surveys in certain countries even though you can join from all countries. So you can become a member, but only have access to something called micro-tasks that pays very little. If you do not know this, it is easy to get frustrated about a site like this, but it is actually just because it is not ideal for the country you live in. I personally do not understand why some sites allow you to sign up even if there is no way for you to earn, but that is how it is on some sites. Later I will show you how to find the sites that are the best match for you. On certain survey sites like ClixSense or the get-paid-to site PrizeRebel, you will get access to surveys from different providers/routers, once you are logged into the site. This means that you will be taken to a router that will look for available surveys for you, and if you take a survey there, you will get the money into your account on the survey sites you took the survey through even though you technically will take the survey through the router. The big advantage of sites that give you access to survey routers is that often you will then find a lot of opportunities here. The disadvantage is that it can sometimes take a little patience to find the surveys you qualify for. The sites mentioned above are some of my favorites, but still, I often do not qualify. But mostly when I try to take surveys from certain providers/routers. There are some routers I just never seem to be able to qualify for surveys from. That does not mean it will be the same for you, as it, as already mentioned, depends on several things whether you qualify or not. So once I figure out what routers never offer me surveys I qualify for, I just stop clicking on these, and instead just click on the ones where I regularly am able to qualify. It is of course also an option that the reason you do not qualify for any surveys on a certain site, is because the site is a scam. But if you have looked for the signs that a survey site is a scam and not found them, it might very well be because of one of the other reasons. As mentioned above, that you do not qualify for surveys cannot be used as an indicator alone to see whether a site is a scam. The reason can also be that it just simply is a really poor survey site. There are MANY survey sites out there, but some of them are just really poor and offers very few opportunities. That is why it is important to find the sites that are worth joining, which we will go into next. 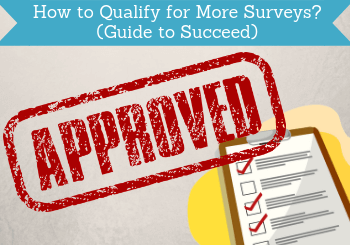 What to do to qualify for more surveys? Before getting into this, I want to make one thing clear – there is no trick you can do to always qualify for surveys. You will keep not qualifying for certain surveys, but the way to get the most out of survey sites is by knowing how to navigate, so you optimize your time. This will lead to you enjoying it and give you success with surveys. Different survey sites have different options and are available in different parts of the world. Some surveys sites might be the best to use in southern Europe, while others are the best in the US, or in Asia, and so on. That is why one of the most important ways to succeed with paid surveys and qualify more often is to find the right surveys for YOU and your country. A part of finding the right sites is to look at the conditions for each of them and sign up for the ones that sound most relevant to you. Sign up for several of them, and then test them out. You will quickly figure out which ones offer the best opportunities for you. You can, however, easily end up wasting a lot of time testing sites that are not even giving real opportunities in your country if you do not know which sites are good to join. I have therefore created lists with the best survey sites in certain countries, so you can easily find the sites with the absolute best chances of earning and qualifying for you. So check that out through the link above to get started easily. As mentioned earlier, some survey sites offer surveys from different providers/routers. Sometimes people sign up for a survey site and only try a few clicks, and when that does not work as expected, they quit. Be a bit more patient, if you want success with paid surveys. Click around a bit and try the different options, and also try on different several days. I have for example noticed that many survey sites do not give very many surveys on weekends. So if you sign up at the weekend, and then do not give it a chance for a bit longer than just one day, you might miss out on what the site has to offer. The trick is to not just give up after trying a few surveys but to try different routers or types of surveys. Give it a bit of time and test it out. Then you will quickly spot which opportunities are the best for you and then you can optimize your time by just focusing on these. Most survey sites have a section with your profile, where you can fill out a bit of information about yourself. Filling out your profile can sometimes help you qualify for more surveys. Especially the sites that send emails, when there are surveys available, use this information to match you with surveys. That means that at some sites, you will get more invitations for surveys if this profile info has been filled out and kept up-to-date. Many sites even give you a reward for filling out this profile so there can be several good reasons to do this. This is a point I often mention in my articles, but it is very important, and therefore I want to mention it again here. To get success with paid surveys, you have to manage your expectations and be realistic. It will not make you rich or a full-time income. If you expect this, you will probably be very impatient and give up before you have really given it a chance. It is however definitely possible to make some nice extra money on surveys, and it is an easy way to start earning online and completely without risk – and you will have your opinion heard at the same time, so in my opinion, there are many good reasons to participate in paid surveys. But you have to find the right sites and do it with the right expectations and not to become rich. Paid surveys are one of the few ways you can earn online where you can start earning right away and where there is no risk or investment involved at all. But you need to do it with the right expectations. If you do it with the right expectations and with the right approach, it is a great opportunity. I hope this info has helped you to get a better idea about how to qualify for surveys or more importantly how to navigate the right way, so you can get the most out of survey sites. Remember that the most important thing to succeed is to find the right surveys for YOU. So check out the list of the best opportunities in your country here to save yourself time and get access to the top paying sites right away. I have made right at $200 in one month (my record) doing surveys, and that was only because I was out of work for 6 weeks due to knee surgery(torn ACL). Thanks for sharing your experiences Daniel. Hope your knee is better. I have been trying to find genuine paid survey sites for a long time and never actually succeeded. Maybe your site can help me. To this date, until I read your post, I thought those paid surveys were scams whenever I read “you are not eligible for this survey”. Sometimes it gets very frustrating, probably that was on of the reasons why I stopped looking to earn money through filling survey forms. I want to know the truth – is it really possible to make a living by filling surveys? Even though I don’t need to do it anymore, but I have never come to a proper conclusion. Maybe I can suggest that work to a few of my friends.This site is so helpful btw. Thanks for your comment Hari. 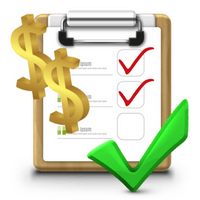 There are many different claims about how much money you can make on surveys. But it is NOT possible to make a living from doing surveys. Sites that claim this are usually scam sites that try to get you to pay to join. It is however possible to make some nice extra cash from it, but if you are aiming to make a living online from it, you will be dissapointed. I have been a member of Toluna and OpinionWorld and have done many surveys and earned hundred plus dollars over the last year. One have to note that surveys are not meant to replace a full time income, but it is a good source of additional income to have any day! Thanks for your comment Leo. I very much agree with you. If you are aware that it is not meant to replace a full time income, then it is a great way to make some extra money, and I also enjoy using that option.